What I want to do is build a Slay-the-Spire-like Map. 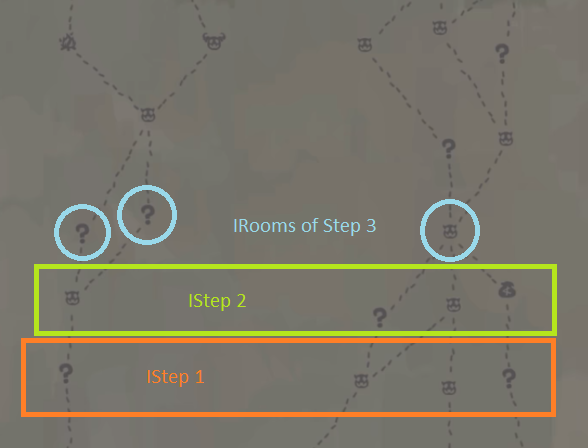 As you can see in the following image, the map is splitted in ISteps and IRooms. Each IStep is connected to the next one by its IRooms. There is no dead-end, so each IRooms is connected with the previous and next ISteps. A IStep has a set of 3-to-5 IRooms. I can connect two ISteps together, which connects the IRooms. Finally, nothing is connected to my to. For this very example, I could force the ones to be in the diagonal, but I want to achieve is a generic algorithm, not a case-by-case one. Browse other questions tagged c# f# or ask your own question.